We first used this method for growing Lentinus Edodes well over 15 years ago and have found that it still produces a nice crop. Just follow the directions and add a full measure of patience. You'll be harvesting shiitake in about 2 months. You're invited on a foray! Please join us as we meander our 160-acre reserve located high on a ridge overlooking the hamlet of Port Orford and Red Fish Rocks. Our reserve abuts Humbug Mountain State Park and lines the ridge to the north. It is believed that for many years the land was uninhabited. Surveys of the area have not presented evidence of archaeological or cultural resources. There are no signs of camping sites or Indian villages. Nor does the location fit into a recorded local history. In fact, for decades the land remained untouched until logged in the 1940s and allowed to naturally re-seed. Survivalists acquired the land later in the 40s intending to establish a colony of like-minded individuals. This plan did not succeed and once again ownership was passed. We acquired the reserve in the late 1990s with the goal of preservation and enhancement. 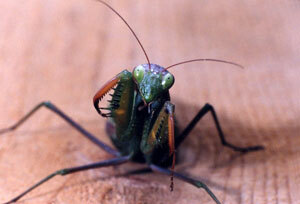 Today the land is host to an astonishing array of native flora and fauna. Tanoak, Douglas fir, Oregon myrtle, spruce, Pacific madrone, canyon live oak, grand fir, Port Orford cedar, Western hemlock, big leaf maple, along with red and white alder dominate the canopy. On the forest floor we are greeted by salal, sword and bracken ferns, tall huckleberry, bear grass, vine maple, wild pea, wild strawberry, snowberry, Oregon grape and green leaf manzanita as well as, unfortunately, occasional poison oak. In the early spring there are showy displays of wildflowers including purple iris, rhodies and foxgloves. Notable inhabitants of the reserve include elk, deer, black bears, coyotes, foxes, raccoon, cougars, bobcats, rabbits, chipmunks, and squirrels. Birds include red tailed hawks, grouse, quail, owls, ravens, wood peckers, flickers, various songbirds, hummingbirds, goldfinches, and, of course, the turkey vulture-whose arrival in the early part of the year traditionally is the first sign of spring. How many of these flora and fauna and wildlife will you be able to spot on our foray? Depending on the season, we’ll expect to find an abundance of edible mushrooms. Predominant species include white and golden chanterelles, pig’s ears, black trumpets, boletus, hedgehogs, cauliflower, matsutake and lobsters. delightful find in the leaf litter. Photo courtesy of Sue Dawson. Of course, there are never any guarantees that we’ll be able to gather edible mushrooms on our foray. 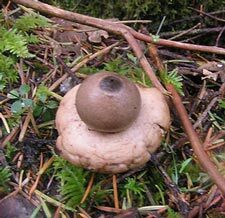 However, you can be guaranteed an interesting and educational foray with two experienced mushroomers on the beautiful southern Oregon coast. When’s the best time to join us? It is true that mushrooming is always somewhat unpredictable. Yet, experience has shown us that if we have a good rain in July, the mushroom season can start as early as mid to late summer and run to Super Bowl Sunday. You’re welcome to call us for the latest forecast. What do you need to bring? Well-fitting walking shoes, hiking boots or tennis shoes are a must. It’s always a good idea to layer clothing so that you can adjust as needed during the walk. Fingerless gloves and a hat in cooler weather can make the foray more comfortable. If the weather is rainy, you might want to bring along another set of clothes to change into after the foray. And, don’t forget to pack your sense of adventure! We’ll start off the foray with a brief discussion of mushrooming: where to look for mushrooms, how to collect them, how to identify some choice edibles – the basics! We’ll provide the collection baskets and tools along with a whistle and compass and walking stick. We’ll have towels for drying off wet surfaces and thermos of hot or cold beverages, depending on the weather. And, we’ll have extra garments in case the weather turns chilly. We’ll probably cover a mile or two on our foray, walking a circular route, much of it on fairly level ground. However, do be prepared for some steeper inclines during our foray. Although we are pleased to provide some accommodation on this route, please be aware that our guests need to be able to walk easily and unaided on uneven terrain. After the foray, consider joining us back at our log home. But please pardon our dust – we’re still under construction. You are welcome to freshen up in our fully furnished guest lounge: take a shower, change out of your mushrooming clothes, and/or peruse our small collection of natural world and local history books while sipping freshly brewed mushroom tea (or other beverage for the more faint of heart!). Or, perhaps you’d like to join us while we're cleaning mushrooms. We’ll be fixing a survivor’s lunch after the foray and you’re invited to join us. Our typical light and local lunch menu might feature an appetizer of roasted chanterelles on toasted bagels; chanterelle and cannellini bean stew with a stirring of white wine and a hint of sage, followed by a warm blackberry cobbler. Typically our forays start at 10:00 and last 3-4 hours. However, we are pleased to cater the event to your specific needs. Please let us know how we can make this occasion more special for you. Forays are limited to 6 guests at a time. Well behaved children over the age of 12 are welcome. Forays are offered at $125.00 for 2 individuals, each additional person $50.00. 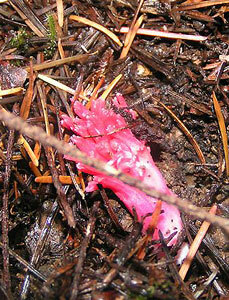 Corals add color to the forest floor. We also offer a special Introduction to Mushrooming which you may wish to join the evening before the foray. 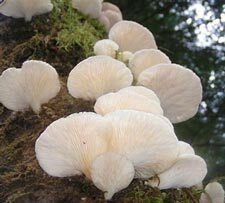 This 2-3 hour session provides an in-depth and comprehensive survey of Northwest mushrooms and, in particular, of mushrooms on the southern Oregon coast. While sipping on local wines (or beverage of your choice) and indulging in appetizers, we'll delve into the mysteries of mushrooms, including their identification, cultivation, preservation and many other topics. 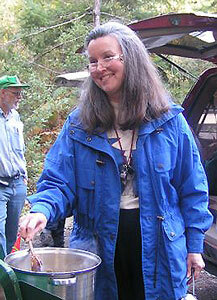 Introduction to Mushrooming is offered at $125.00 for 4 attendees, each additional person $25.00. To reserve a night in our sleeping room with continental breakfast, add $150.00, double occupancy. The area offers many other housing opportunities. For example, WildSpring Habitat (a small and luxurious boutique resort) and the Castaway (the most westerly motel in the contiguous US) are within an easy drive of our foray site. Keep in mind that Curry County is part of the Wild Rivers Coast and offers numerous outdoor opportunities including personalized lighthouse tours, guided fishing trips and jet boat trips (Jerry's Jet Boats and the Mail Boats), and a spectacular seasonal volkswalk in Port Orford. You may wish to consider staying an extra day or two in the area simply to enjoy these and other events. Proceeds from our forays will help enhance the prize money for future contests. 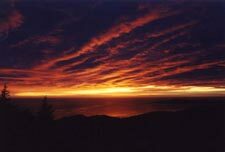 Please consider joining us the next time that you are in Port Orford on the beautiful southern Oregon coast. We're not experts, but we love sharing our fungal world! Invite us, and we might just bring our favorite mushroom soup! Over the past years we've been privileged to share our mushrooming experiences, and the knowledge we've gained as mushroom devotees with others. We've been invited to speak to mushroom clubs, garden clubs, Rotary clubs and other organizations. We've talked about identification, preservation, cultivation and other topics. We've led mushroom walks and forays. And, for a number of years, Steven's served as the mycologist for the non-profit Hillaire's Wild Game Banquet held every April in Portland. If we can enhance your relationship with these fascinating fungi that populate the amazing world around all of us, let us hear from you. We'll do our best to share our fungal world with you! You are welcome to contact us by e-mail at madaboutmushrooms@gmail.com or by mail at PO Box 377, Port Orford, OR 97465. If writing is your muse, please read on and consider submitting your original piece for our first annual competition. 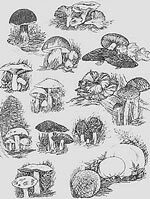 Throughout the centuries mushrooms have been intertwined with mystery and mayhem, mistrust and dread. They've had a relationship with death and decay, fairies and elves and witches. Join in this tradition or turn your back on it. Go wherever your imagination takes you! Create a fairy tale, a mystery, a romance. Or, create an ode, a verse, a rhyme, a limerick, a sonnet, an epic. Or, how about a comic! We'll gather together Curry County mushroom fanciers who'll review all the entries. Their "favorite" submission will be the recipient of our $100 award and will be spotlighted on this website. like you to enter our writing contest! E-mail us your original, unpublished submission written in English for inclusion on our website, using "Writing Contest" as part of the subject line. All entries must be received at MadAboutMushrooms@gmail.com by midnight on June 30, 2010 to be eligible for the award. The winner will be announced on this website on or before July 15, 2011. Likewise, the $100 check for the winner will be mailed by July 15, 2011. All entries must include a place name in or reference to Curry County. For example, the entry could mention Port Orford, Cape Blanco, or the Rogue River. All entries must include some reference to mushrooms. This is a free contest, open to all who wish to participate and the winner is chosen solely at the discretion of the judges. There is no minimum or maximum number of words that must be submitted to qualify. Be sure to include your name, mailing address and phone number; we need to be able to easily contact you. This information will be kept from the judges so that they can make their selection without prejudice. By submitting an entry, the entrant certifies that he/she has authored their submission and that, as such, it reflects their own efforts and creativity and is unpublished. Submission must not violate any copyright laws. The entrant understands that their submission may be published on this website and/or as part of a manuscript, and, by their submission, authorizes and agrees to such publication without any compensation other than if they are selected the prize winner. Unless authorized in writing, we will not share your personal information with anyone for any reason whatsoever. All decisions are final. So, put your creative energies to work and start tapping on the keyboard. Hope to be reading your contribution soon!